Food influences our overall health and wellness in complex ways. By combining powerhouse healthy foods together, you’re able to truly reap the benefits of not one, but two as they compliment each other and ultimately deliver stronger benefits for your body – when they’re together. For example, Fats and carbohydrates help you absorb nutrients better. The vitamin C in fruits and vegetables help you absorb more iron. And those are just a couple examples to name a few! 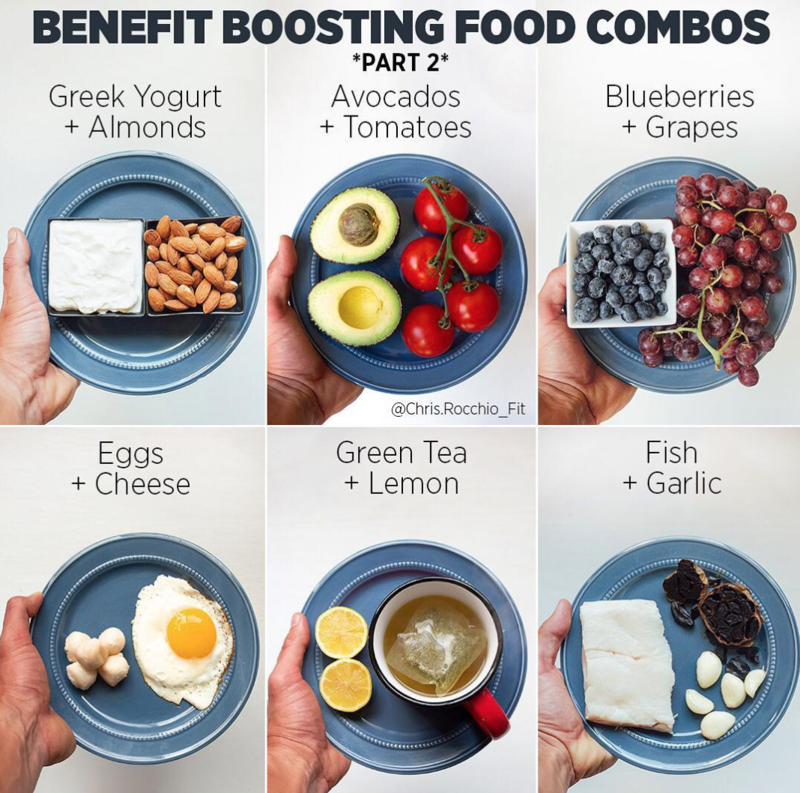 Daily supplements, like vitamins and protein powders are good to use, yes, but it’s combining powerhouse nutrients together with healthy food combinations that really will improve your health. Almonds + Yogurt: Fat-soluble vitamins found in dairy products (A, D, and E) are activated and absorbed best when eaten with healthy fats like those found in nuts. Tomatoes + Avocados: Tomatoes contain the carotenoid lycopene, which may decrease the risk of some cancers. Healthy fats, like those in avocados, make carotenoids more bioavailable. Blueberries + Grapes: Both of these fruits are packed with antioxidants, and the antioxidant effects are boosted when you eat them together. The same goes for mixing up antioxidant-rich veggies, like leafy greens, beets, and broccoli. Garlic + Fish: The minerals in fish help make the best use of the anti-inflammatory fish oils, EPA & DHA. Garlic has its own long list of benefits. Together, this healthy food combination helps reduce LDL cholesterol. Green Tea + Lemon: Vitamin C in lemons helps your body absorb antioxidants in green tea up to 6x more than if you drank it alone. This can also improve brain function and fat loss. Eggs + Cheese: Vitamin D in egg yolks maximizes the absorption of the calcium in cheese. Sufficient calcium in the body will promote neurotransmitter health (mood/focus) and stabilize hormones to reduce PMS & weight gain. Broccoli + Tomatoes: Both have been shown to reduce the growth of tumors, but the combo is even more effective at shrinking the size of prostate-cancer tumors. Eggs + Cantaloupe: Protein from eggs (or other meats) slows the absorption of glucose from carbs. This minimizes insulin & blood-sugar spikes, which slows the absorption of glucose and makes you feel full. Turmeric + Black Pepper: The curcumin in turmeric is anti-inflammatory and tumor-fighting but has low bioavailability on it’s own. Adding black pepper enhances curcumin’s bioavailability by 1,000x. Red Meat + Rosemary: The antioxidants, rosmarinic acid and carnosic acid, in rosemary soak up the free radicals, which are carcinogenic, that appear in the charred meat when you grill at high temps over an open flame. Lemon + Kale: Vitamin C helps your body absorb plant-based iron, as non-heme (plant-based) iron is less bioavailable. Apples + Chocolate: The antioxidants in apples (quercetin) and chocolate (catechin) have benefits of their own. Together, the combo loosens clumpy blood platelets, improving cardiovascular health. Keep in mind that these synergies are present in more combos than just the examples listed, I just wanted to make it simple for you to get started! The best part about these healthy food combinations is you’ve probably got at least one or two of them in your fridge already. Start incorporating these synergistic foods into your diet and start to feel the health boosting benefits today. Looking for for more healthy combinations and easy-to-make snack ideas? Check out my 101 Healthy Snacks E-Book here.